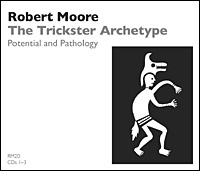 Robert Moore leads a workshop on the trickster archetype—"psyche's answer to oppression and grandiosity." Fearless and uncompromising, it exposes pretension and pomposity wherever it is manifest—either in self or other. If possessed by this archetype, however, one becomes a compulsive critic who seeks to ridicule, shame, and humiliate without compassion. Meant to be an agent of liberation and the ally of new creations, the shadow expression of this psychological structure becomes the enemy of both creativity and creation itself.